Recently, a few miles away from the city the energy was infectious at Newark Venture Partners Labs demo day hosted at the Prudential Center. Nine category-leading startups presented the culmination of their work from their participation in the 3-month program at the Labs. Newark is in the midst of a multi-billion dollar redevelopment and was recently shortlisted for Amazon’s new headquarters. 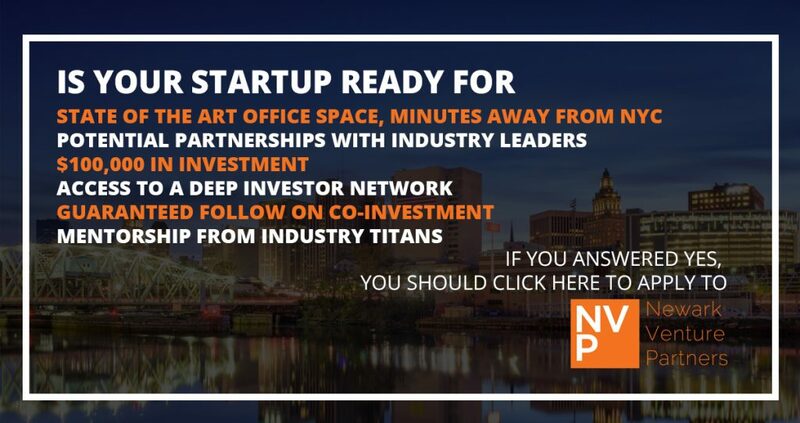 Shaping the technology landscape in the city’s revitalization is Newark Venture Partners, which dubs itself as a bridge-to-seed funding program for promising startups that have achieved initial market validation. 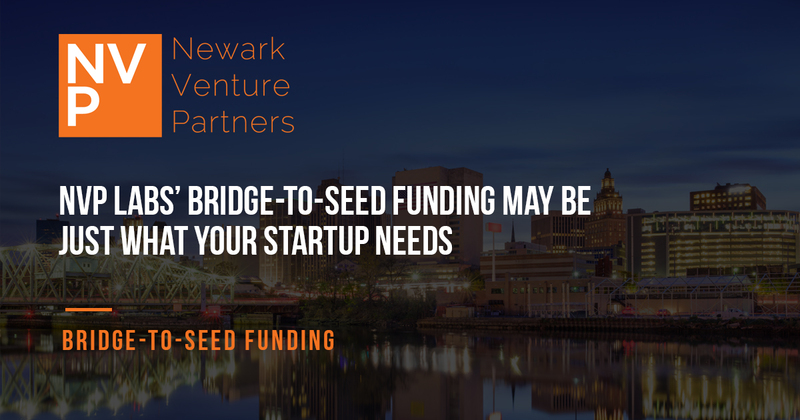 The venture fund is armed with over $40M in dry powder with a mandate to bring the next generation of leading B2B startups to Newark through bridge, seed and Series A investments. Lab applications for its next class of high growth startups are now open but you need to act fast. With recent reports indicating that raising seed funding is becoming more difficult for early stage companies, NVP Labs has retooled its program to serve as a bridge for companies with demonstrable traction to further refine their models ahead of their next institutional funding round. Over the three cohorts since the program’s inception, 65% of the companies have gone on to raise additional funding after completion of the program, significantly higher than the 50% rate found now in traditional accelerator programs. The program pledges a $200K investment in your company if accepted – $100K upon admission in the program and another $100K co-invested in your next venture-backed institutional round. In fact, NVP Fund has gone on to lead a number of subsequent funding rounds for NVP Labs companies and will invest up to $1M per company. The program offers a dedicated coach to participants to specifically drive fundraising. “NVP doubled down on our company, successfully led our seed round and took us to the next level. To us they are more than just investors, they are family,” remarked Ron Fisher, CEO Of Bowtie, a former NVP Labs bridge-to-seed company. Sales are at the heart of every startup’s operations. The program understands this and is structured to catapult sales and marketing during the 3 months, offering personalized sales and marketing coaching to drive revenue. Both the Labs and Venture Fund are supported by a number of innovative corporate limited partners that include Audible, Dun & Bradstreet, Prudential, RWJBanabas Health, the New Jersey Devils, and Horizon Blue Cross Blue Shield of New Jersey. At the recent demo day, the program announced two new partners – TD Bank and Panasonic. Getting access to these industry leading partners across an array of industries is a differentiating component of the program that drives real results. Warm introductions go a long way in the tech world and the program is designed to build partnerships with these corporate partners that are literally invested in the success of the companies. “Expanding our US base is our biggest priority. NVP made valuable intros to their corporate partners. And they’ve been at the table facilitating lab discussions. That has really made the difference,” said Yoav Yanovski, CEO & Netanel Gilad, CTO of Botique, a founder from the most recent NVP Labs cohort. The program starts this April with demo day at Prudential Center in front of NVP’s network of investors, corporate partners, and press in June. Founders split their time between fundraising and sales, with a heavy emphasis on refining their sales . While the program is industry agnostic, the program is best suited towards B2B startups. Participants are housed in a cutting 25,000 square foot office space steps away from public transportation, making the commute to Newark seamless if your team resides in NYC. The space happens to be situated in the same building as Audible and resident portfolio companies have access to the deep engineering expertise of the Audible team – whether it be system engineers, architects, technologists, business experts, or even data scientists. The mentorship-driven program also offers guidance from industry experts, both in the New York and Newark business communities. The program has already backed several prominent NYC startups that include ClaimIt, Hyr, Trendalyze, Ziel, and Industrial/Organic many of which have raised notable subsequent funding rounds. “NVP’s investment was truly catalytic. In addition to the initial bridge capital, they co-invested in my round. That gave investors on the sideline confidence and helped me close my round on time,” said Isa Watson, CEO of Envested, another founder in the program. 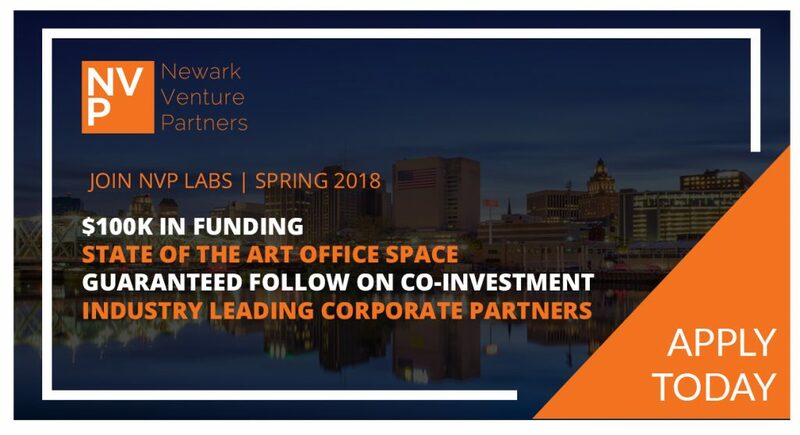 Join the Spring 18 Newark Venture Partners Lab cohort by applying now.